Consisting of the young or old, it's crowded along Georgia's defensive line entering the 2015 season. ATHENS—While observing eight Bulldog defensive linemen go through tackling-dummy drills on Tuesday afternoon, a few things are rather apparent: for one, defensive line coach Tracy Rocker can be quite challenging, once hollering at a large lineman to hit the bag harder, adding “I bet you would if I put a piece of [food on the bag]!” Nevertheless, there’s more so an intriguing mix of players evident heading into the 2015 campaign, most of which are essentially newcomers, or well-seasoned seniors, and very little in between. Currently on the Georgia roster, there are four senior defensive linemen: Sterling Bailey, Chris Mayes, Josh Dawson, and James DeLoach—all except DeLoach having started at least five games for their careers. There are four newcomers: redshirt freshman Kenyon Brown, who was moved from outside linebacker, true freshmen and early enrollees Jonathan Ledbetter and injured Michael Barnett, and Joseph Ledbetter, Jonathan’s older brother who was moved from tight end after transferring from Pfeiffer University (Misenheimer, N.C.), where he played basketball for two years. 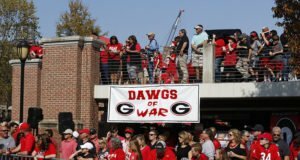 Considering there are four others listed as defensive tackles or ends due on campus for fall camp, including much-heralded Trenton Thompson and Chauncey Rivers—both of whom were considered by Rivals among the top-10 overall prospects in the state—there are eight newcomers along the Bulldogs’ defensive line. Finally, there’s redshirt sophomore John Atkins, who totaled nine tackles in 10 games last season—the only defensive lineman out of 13 this season who is not either a senior or a newcomer to the program. Dawson has appeared in more games at Georgia (38) than any of his fellow linemen, including four starts at defensive tackle a year ago. It appears he is currently battling Bailey, however, for the starting defensive end spot vacated by the departed Ray Drew. Playing in 29 career games, Bailey has started the most amongst the group (nine career starts), including once last season at defensive tackle. 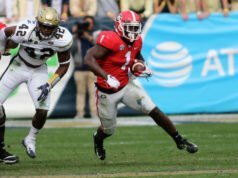 Besides two defensive ends, or what could be considered an end and a defensive tackle, Georgia also employed a nose tackle last season for a three-man front. However, the Bulldogs often started a third outside linebacker or fifth defensive back in 2014, resulting in three starting linemen for five games, just two starters for the other eight contests. More of the same unusual defensive alignment is expected this season. 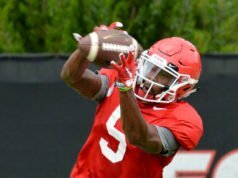 Richt stressed, “We’re going to roll people [along the defensive line], and they’re going to get snaps.” However, as little as six defensive linemen are anticipated to be “rolled,” or rotated this season—or, the same number which appeared in at least 10 games a year ago—and certainly no more than eight. Therefore, fewer than half of the 13 defensive linemen expected to report in August could see significantly playing time in the fall. Who will be left out of the rotation? With unpredictable, defensive coordinator Jeremy Pruitt calling the shots, it could be anyone’s guess. Someone—that is, whether it’s a senior, a newcomer, or Atkins, and evidently that’s all—will take your job. And, along Georgia’s defensive line in 2015, there are very limited spots for the taking.